Sessions covered technical topics and current research, discussed innovative program designs, and provided healthy home assessment education. See the set of presentations here. I was pleased to moderate a vibrant panel among these offerings: What Do We Really Know About the Health Benefits of Energy Upgrades? with experts Ellen Tohn, Kevin Kennedy, Jonathan Wilson, Ely Jacobsohn and Jonathan Cohen. See details below. We were not alone in our excitement for the inaugural healthy housing track. Eager to learn about this emerging field, attendees filled each session (often beyond capacity). Central to this discussion is how to support the existing home performance workforce to leverage this massive opportunity: The IAQ market is projected to total $10.8 Billion by 2021. 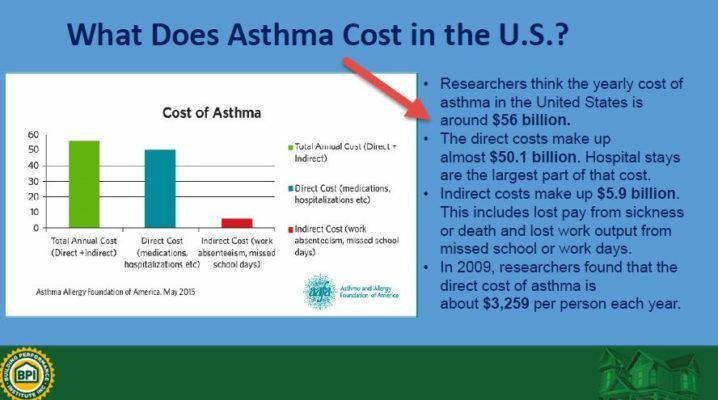 * Asthma costs have soared to $56 billion annually. How can we address and leverage this within home performance? What Do We Really Know About the Health Benefits of Energy Upgrades? When you consider that people spend 80-90% of their lives indoors, it’s no wonder that changing the indoor environment through energy efficiency creates health co-benefits that are real and valuable. I’m grateful to the Home Performance Coalition team for their vision in creating the conference track. It helped to illuminate the power, complexity and opportunities related to this emerging field. E4TheFuture continues to engage as this field evolves. We invite you to Steve Cowell’s session on this topic at the US DOE Better Buildings Summit May 15-17. Upcoming conferences that include experts tackling program integration include the Northeast Indoor Air Quality & Energy Conference May 1-3, and the National Energy and Affordability Utility Coalition Conference June 26-28.